Former Trump national security adviser Michael Flynn leaves federal courthouse in Washington, Tuesday, July 10, 2018, following a status hearing. 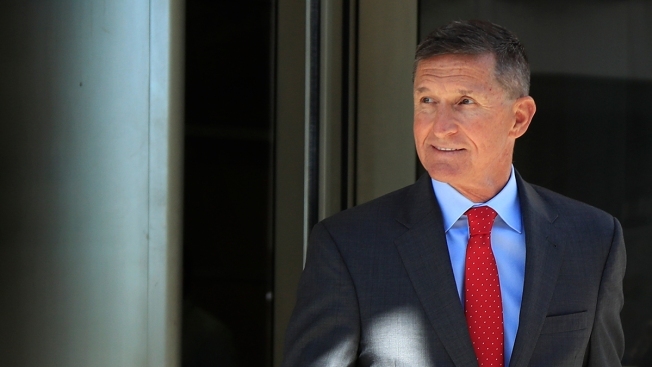 An attorney for Michael Flynn said Tuesday that the former national security adviser is "eager" to proceed to sentencing and put his criminal case behind him. Attorney Robert Kelner made the comments during a court hearing Tuesday before U.S. District Judge Emmet Sullivan. It was the first time Flynn had appeared in court since his guilty plea last year to lying to the FBI about his contacts with Russian officials during the presidential transition and his Turkish lobbying work. Kelner said Flynn wants to put this "chapter" behind him, but special counsel Robert Mueller's team has requested additional delay while the retired U.S. Army general continues to cooperate with the investigation into Russian election interference and whether President Donald Trump obstructed justice. Sullivan said he was amenable to delaying sentencing until prosecutors had signaled they were ready but wanted to hold off on having the probation office prepare a pre-sentencing report until a date was set. The two sides will give the judge another update by Aug. 24, when he said he would consider setting a sentencing date for 60 days later in late October. Under federal guidelines, Flynn's sentence is estimated to be between zero and six months in prison. Flynn, who served as a top Trump campaign surrogate and briefly served as national security adviser before his firing in February 2017, did not make a statement after the hearing. In addition to discussing a sentencing date, Kelner told Sullivan that the facts of the case "are not likely to change in any material way" between now and sentencing. And Sullivan told both sides he wouldn't "micromanage" Flynn's cooperation with Mueller's investigation. The judge said he had partly held Tuesday's hearing to meet Flynn and the attorneys in the case before sentencing him. Another judge had handled Flynn's plea last year before recusing from the case, resulting in it being assigned to Sullivan. Also Tuesday, a new lobbying and global equity consulting firm announced that Flynn would serve as the global strategy director — but Flynn's attorneys said later that Flynn had not joined the firm. Stonington Global, headed by lobbyists who recently represented the government of Qatar, said Flynn would oversee business development and "provide strategic consulting on international military, intelligence and peacekeeping activities." It released a statement attributed to Flynn in which he said he will be using his White House experience and decades in national security to help companies and governments "enhance the goals of freedom and liberty." But Flynn's attorneys, Kelner and Stephen Anthony, then issued a statement saying: "General Flynn has not joined Stonington and did not personally issue any public statement. He was aware that a statement was being drafted, but he did not intend that it be issued at this time. Its issuance now in his name appears to have been the result of a misunderstanding." This story has been updated with Flynn's lawyers saying Flynn has not joined the Stonington Global firm.